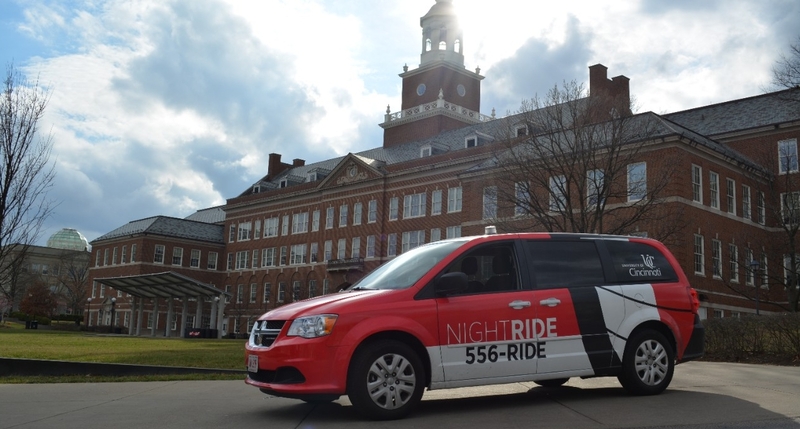 NightRide, a program within the University of Cincinnati's Public Safety Department, provides on-demand safe transportation for students, staff and faculty within one mile of UC's main campus. In addition, the students who drive NightRide vans serve as extra eyes and ears for law enforcement. NightRide has 11 vans and operates from 8 p.m. to 5 a.m. everyday, however wait times are often higher after midnight due to limited service. A Bearcat card is required to utilize NightRide. Each person who presents a valid card is allowed one guest. Students, staff and faculty can also request NightRide service using the NightRide app, available on the App Store and Google Play. The app can be used to set your pickup and drop-off location, search for locations, receive notifications when your van arrives and more. Are you interested in working for NightRide? Go to https://jobs.uc.edu. Every day 8 p.m. - 5 a.m.
Nov. 1 to March 11: 6 p.m. to 5 a.m.
New Year's Eve: 8 p.m. to 2 a.m.
Last call for rides is taken at 4:30 a.m.
Use the NightRide App, which you can download from Google Play Store or from the App Store. Search for "UC NightRide." When you request a NightRide, you will need your 6+2, student M number or phone number, in addition to a pickup location, drop off location and the number of people who will be in the ride, up to six. Each UC student with an active Bearcat Card is allowed to bring one guest. Please only schedule one ride per ID. If you are going to a separate location from the rest of your group, it is best for each person to place their own ride. We will call when we are enroute. You should be outside and ready to leave when we arrive. The driver will wait for five minutes, after which the driver will cancel your call and you will have to place another ride. You must present a Bearcat Card upon request, failure to do so may result in your ride being refused. NightRide will be closed on Thanksgiving, Christmas Eve and Christmas Day. Service will be limited on the Fourth of July, New Year's Eve, New Year's Day and Martin Luther King Day. NightRide operates during spring break, summer, and between semesters. Service during these times can be limited, which may cause longer wait times. When the University closes or shuts down operation of classes for weather related emergencies NightRide will not operate. All other weather related closures can occur and will be announced via Twitter @UCNightRide. NightRide may also close for other emergency situations if the safety of the student workers and the passengers could be put at risk. Listed below are the NightRide policies that students, faculty and staff must adhere to in order to receive service. You may denied service if you cannot present a Bearcat Card upon request. No alcohol, opened or unopened, is permitted in the vehicle. No vaping or smoking is permitted in the vehicle. Please take trash with you when exiting the vehicle. Cursing, rude behavior or obscene gestures will not be tolerated toward the student workers or other passengers. You will be asked to exit the vehicle or refused a ride. If you refuse to cooperate with the workers, University Police will be called. If you appear to be too intoxicated for safe transport, you may be refused a ride. Student workers will call the University Police, and or medical assistance for you. We do not transport to the hospital for emergency situations, we will call medical assistance for you. Walk ups are only taken if the van has room for additional riders and this is based upon time, location and the numbers of riders waiting for service. We recommend you call and book your ride. You may be denied a ride should you cancel more than three times in one night. If you are found to have been rude, refused to cooperate, or displayed questionable behavior, which resulted in the police being called, you could be refused use of the NightRide service for up to one year depending upon the severity of the incident. Carry-on items must be able to be held in your lap. We cannot transport bicycles, sports equipment or other large objects. Children are not allowed to be transported in the vehicle without proper safety seating as required by law. No animals are allowed. Service animals are allowed as long as they are properly identified as a service animal. Passengers are required by law to wear seatbelts. The vehicles will not be filled beyond the recommended number of passengers for that vehicle. NightRide is not responsible for lost or stolen items which are brought on to the van. If items are found on the van they are turned into the University of Cincinnati Police Department and the given to Lost and Found, which is located in Edwards 4. Items can be retrieved on the next business day.